While I am not Irish (at least that I know of), I think there is truth to the saying that everyone wishes to be Irish on St. Patrick’s Day. 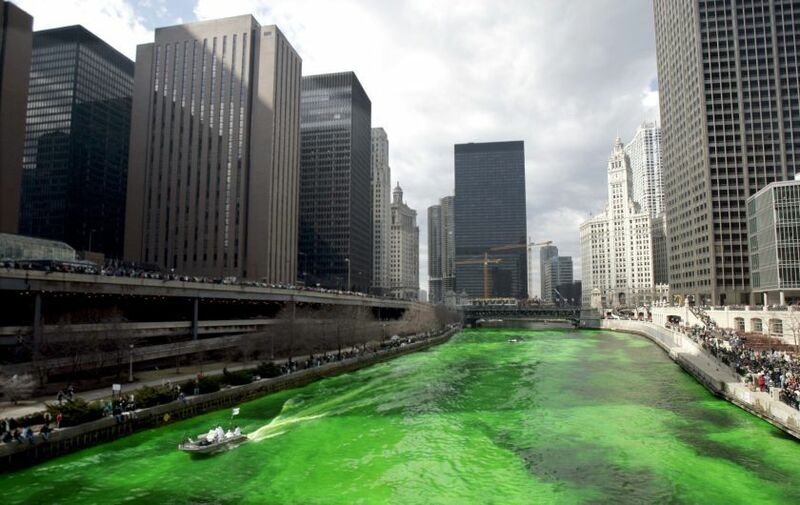 Especially in Chicago, which has some of the largest St. Patrick’s Day parades in the world. Yes, you read that right. 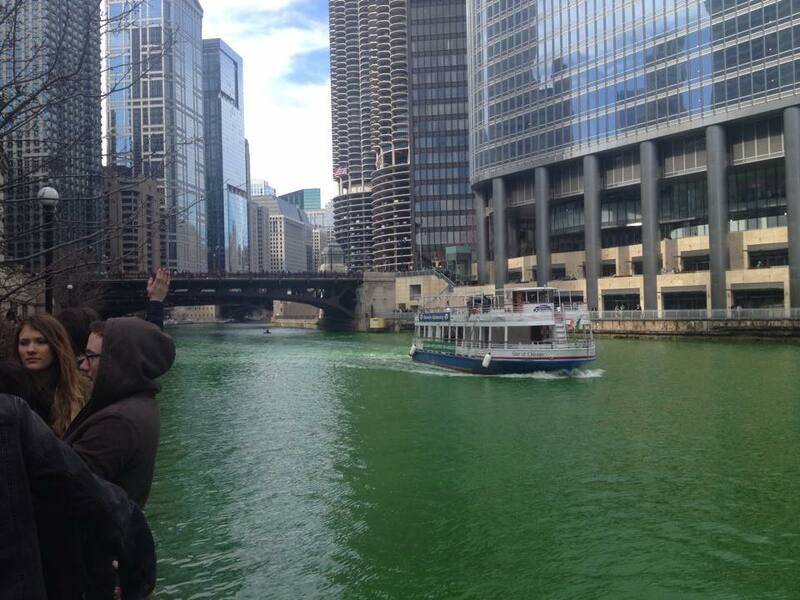 Chicago has more than one St. Paddy’s Day parade. In fact, the official Chicago parade is strongly rivaled in size by the South Chicago St. Patrick’s Day parade. There are many more, but one of the most famous traditions happens before the official Chicago parade on Saturday at 9:30 a.m. with the dyeing of the Chicago River. I decided to take the Indiana commuter train to the Windy City to experience this holiday in Chicago style. Keep in mind that Chicago – like many cities in the U.S. – doesn’t often celebrate its main St. Patrick’s Day parades on March 17 except when the holiday falls on Saturday. Instead, the city always holds their biggest parades on Saturday and Sunday. 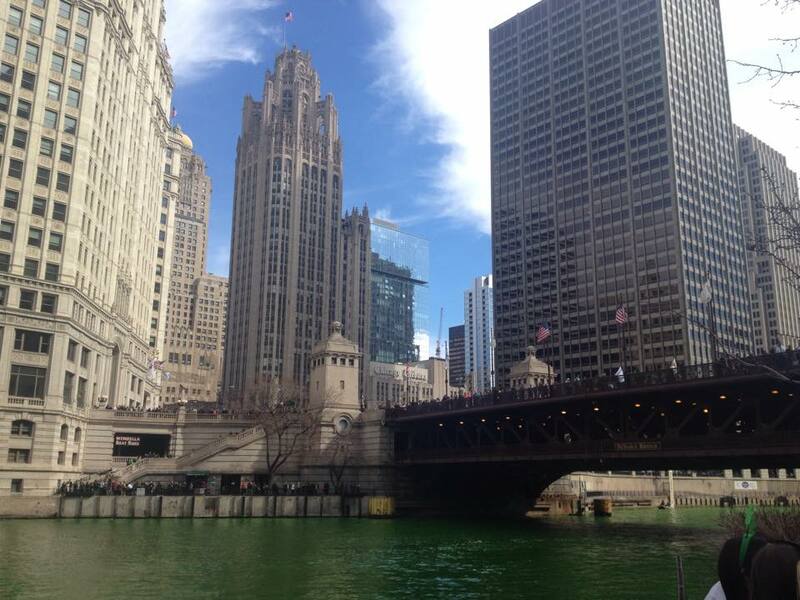 After arriving at Millennium station on Saturday morning, March 14, I walked up Michigan Avenue to the river. There were thousands of people on the streets overlooking the river. For about 60 years, members of a local plumber’s union have carried out the tradition of spreading their secret dye into the river from small boats. At first the dye appeared orange and I wondered if they messed up their formula this year. However, after a short period of time, an emerald green appeared almost as mysteriously as a leprechaun. It was glorious while huge crowds gathered for selfie photos with their friends. The city of Chicago is in the process of dramatically expanding its Riverwalk to be much in the style of the one in San Antonio, Texas. Part of it began in 2001, but the pedestrian area is being extended six blocks from State to Lake streets along the north embankment of The Loop and the south bank of the River North neighborhoods. 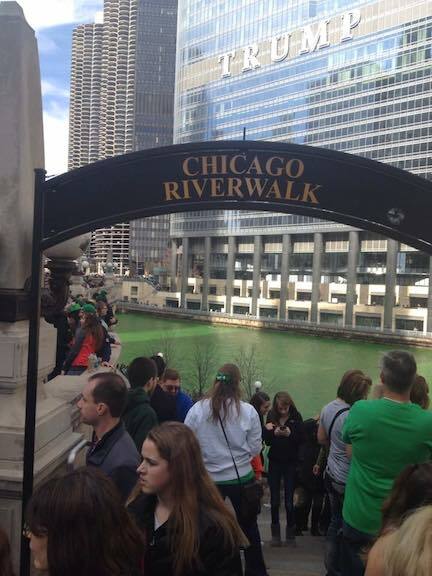 This year was one of the first times that visitors could walk below The Loop on part of the newly constructed Riverwalk. It promises to be great when it’s completed soon. Later I walked down Michigan Avenue to Grant Park to watch the official Chicago St. Patrick’s Day Parade. Columbus Drive was packed with wall-to-wall people. I didn’t stay long because I had to meet up with a friend later for coffee, but this was one of the best parades I have ever seen. In addition to the floats, there was fantastic Irish music, dancing lasses and plenty of green. It almost felt like I was hanging out at a céilithe in Ireland with all of the raucous celebrating, bagpipes and shamrocks. There were plenty of vendors selling Irish items, but it was already the largest crowd I’d ever seen wearing green. 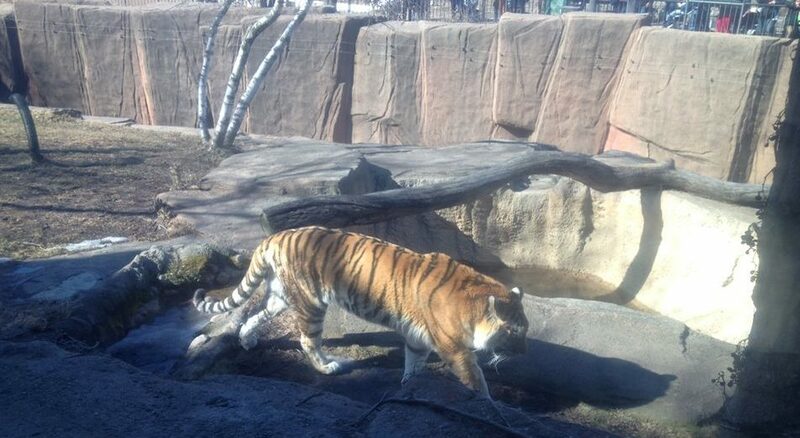 After meeting up with my friend, I took a break from the human zoo by taking the Red Line north to see the real thing at the Lincoln Park Zoo. 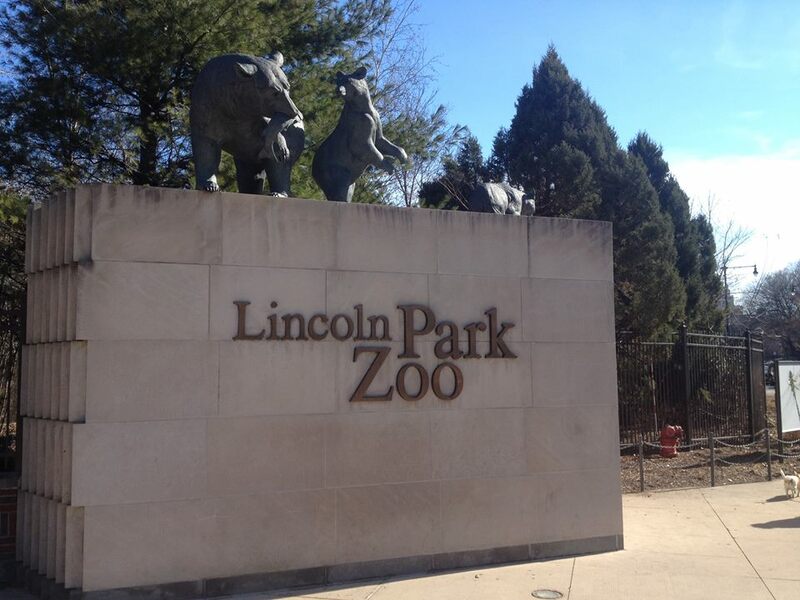 I took a taxi and arrived at the 35-acre zoo located in Lincoln Park. Founded in 1868, it is one of the oldest zoos in the U.S. One of the things that makes this zoo so unique is it’s one of a few in the nation that is absolutely free to enter. 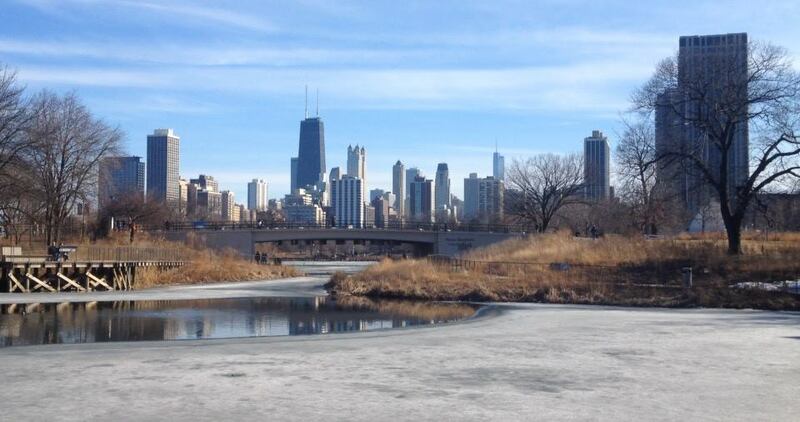 During the winter, the zoo offers free ice skating. However, St. Patrick’s marks the return of spring and the pond was finally thawing out. The animal habitats here are very interesting. I most enjoyed the exhibits housing the big cats and gorillas. The hyenas seemed to be hyper as they sensed spring was in the air. Unfortunately, the bear and penguin habitats were closed for re-design so I missed seeing my favorite wild animals and birds. After visiting the zoo, it was on to Wrigleyville – Chicago’s party headquarters. The neighborhood of course is home to Wrigley Field and the Chicago Cub’s baseball team, but it’s also where young people go to party in the city. In the movie “Back to the Future II,” 2015 is supposed to be the year the Cubs finally win the World Series. This almost seemed like a preview of what the crazy celebrations could look like. Actually, visiting Wrigleyville on St. Patrick’s Day reminded me a bit of Fat Tuesday in New Orleans’ French Quarter. Young people had been drinking since the morning, so it was already getting pretty rowdy in the late afternoon. I saw the police making a few arrests and heard a couple walking behind me saying they didn’t want to be here when the sun went down. Lines to get into some of the bars and pubs wrapped outside the buildings and well into Clarke Street. Numerous guys and girls stumbled forward on their marches through the streets yelling “I love you” and other things to complete strangers I cannot repeat. 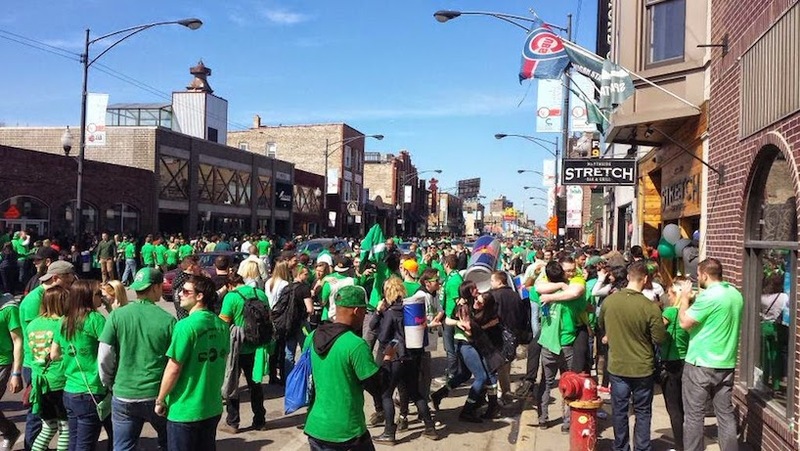 If hell is indeed real, it might look like Wrigleyville on St. Patrick’s Day Saturday. Afterwards I grabbed pizza at Big G’s Pizza, a well-known pizzeria selling pizza by the slice. It was a great way to avoid the crazy bar crowds before heading back to Millennium Station for my train back to Indiana. If you want the crazy college-kids atmosphere, Wrigleyville is the place to go. But if you are older, your best bet for a classier St. Patrick’s Day party might be to check out some of the bars in River North for a pint of Guinness or some shots of Irish whiskey. Cheers!